For ither uises, see Blumenau (disambiguation). Blumenau is a ceety in Vale do Itajaí, state o Santa Catarina, in soothren Brazil. Is 130 km awa frae the state caipital, Florianópolis. It wis foondit on 2 September 1850 bi Dr. Hermann Bruno Otto Blumenau alang wi 17 German immigrants. A few years later Fritz Müller migratit tae Blumenau as well. 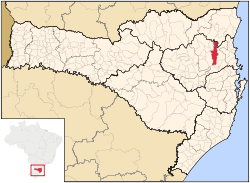 As o 2006, Blumenau haed an estimatit population o 302,000 fowk, wi an aurie o 519 km². The main ethnic oreegin o the ceety indwallers are German The ceety displays mony historical an cultural reminders o thair heritage, sic as hooses an ither biggins biggit in a tradeetional German style, statues, an memorials. Blumenau, compared tae ither Brazilian ceeties, haes a vera heich staundart o livin, wi a Human Development Index o 0.855 as o 2000. The ceety is locatit in a valley bisectit bi the Itajaí-Açu River, surroondit bi hills wi forests. The lawer auries, includin touers an taw biggins in the ceety center, constantly suffer frae the threat o floods. Blumenau's first recordit fluid teuk place in the dawn on 23 September 1880. The warst teuk place in 1983 an 1984, whan the ceety wis completely isolatit for weeks. The day, Blumenau is well-prepared against sic threats, but mony ceetizens prefer tae live in heicher auries spread intae the nearbi hills an plains tae avoid floodin. Housomeivver, this plannin coud no avoid an even warse floodin in late November 2008, killin ower 100 an thoosans evacuatit. The climate o Blumenau is considered tae be subtropical, a climate o transition atween the predominantly tropical climate o Brazil an the predominantly temperate climate o Argentinae. Unner the Köppen climate classification, the ceety haes a wairm, humid subtropical climate. Blumenau, lik the entire state o Santa Catarina is locatit sooth o the Tropic o Capricorn; tharefore it is mild in the winter wi temperaturs averagin 16.6 °C (61 °F) an wairm an humid in the simmer wi temperaturs averagin aroond 30 °C (87 °F). Blumenau's main economic activity is still the textile industrie, responsible for lairge manufacturers sic as Cia Hering, the Karsten an Teka. Anither aurie o focus is that o information technologie, an the ceety the heidquairters o the sae-cried Valley o the software, an mony software leaders in its segment, some o whom wur born in Blusoft an Instituto Gene, incubators o companies in the sector. Blumenau is emphasisit in ither industrial sectors sic as metallurgical, mechanical an electrical equipment an aw, an is the lairgest producer o pole transformers in Brazil. Haes a strang economy, boostit bi strang trade, service an tourism events, wi exhibitions o internaitional projection, which are generally held in German Village. A new mercat, but expandin rapidly is the production o beer craft, sic as Eisenbahn. In 2005, the ceety haes an export o products equivalent tae US$405 million (R$820 million), representin 6.1% o exports o the state in this year. Even tho Blumenau haes its awn airport, normally passengers uise scheduled flichts operatit frae Ministro Victor Konder Internaitional Airport, locatit in the nearbi municipality o Navegantes. Gol Airlines and Azul Brazilian Airlines affer for its passengers free bus transfers atween Navegantes an Blumenau at regular times. The Secretariat o Tourism o Blumenau maintain 4 tour routes coverin different aspects o the ceety. An besides thir, anither attraction is the festival o the municipality. An aw, the Oktoberfest o Blumenau, held ivery October attracts ower a million tourists ivery year. Actress Vera Fischer is frae Blumenau. Rafael Schmitz, Lille OSC fitbaa player. ↑ População residente por cor ou raça e religião/Município = Blumenau - SC/Cor ou raça = Total/Ano = 2000. ↑ "Local Transportation-Navegantes". Gol Airlines. Retrieved 27 March 2011. ↑ "Ônibus Executivo/Blumenau-Aeroporto de Navegantes" (in Portuguese). Azul Brazilian Airlines. Retrieved 27 March 2011. This page wis last eeditit on 11 Mairch 2018, at 03:06.